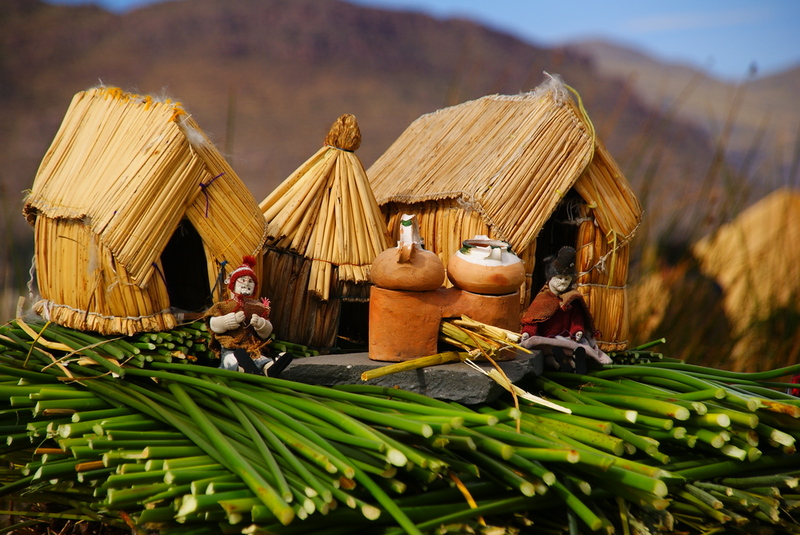 A miniature demonstration of how the Uros people build their floating islands from the totora reeds. An elderly lady with leathery skin and wrinkles wearing a bowler hat and colourful attire. 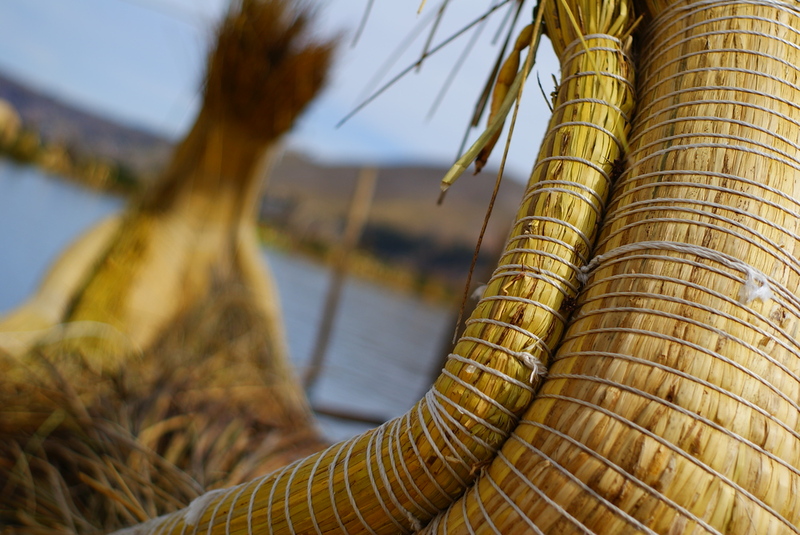 A close-up shot of the totora reed boats made by the Uros people – Lake Titicaca, Peru. 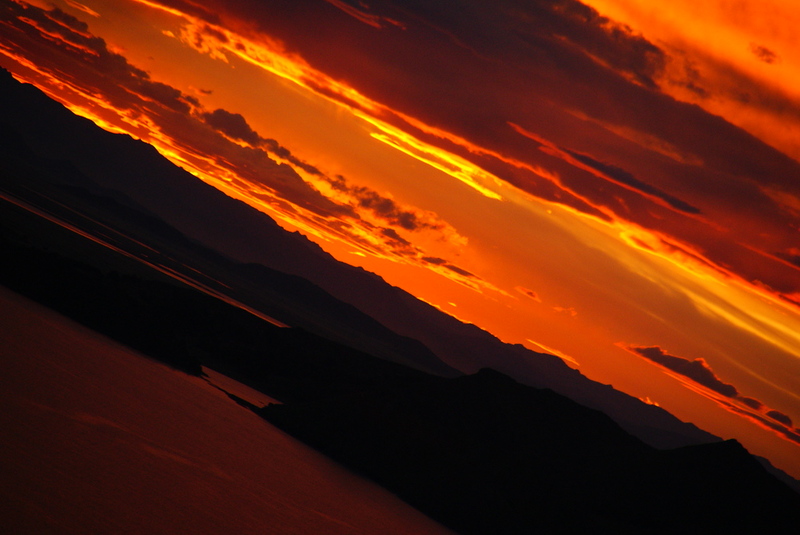 A gorgeous sunset, in which the sky appeared to be on fire, over Lake Titicaca from the Peruvian side. 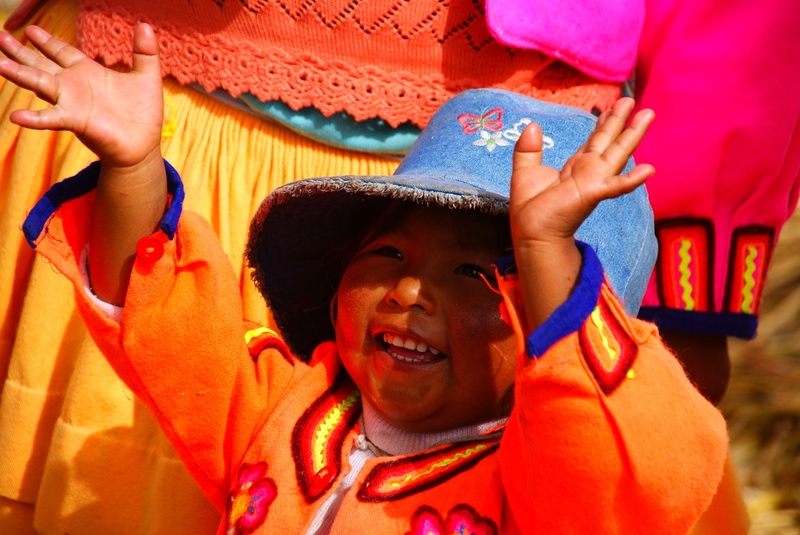 A young child dressed in traditional colourful clothes gleefully sings and performs for a group of tourists – Lake Titicaca, Peru. 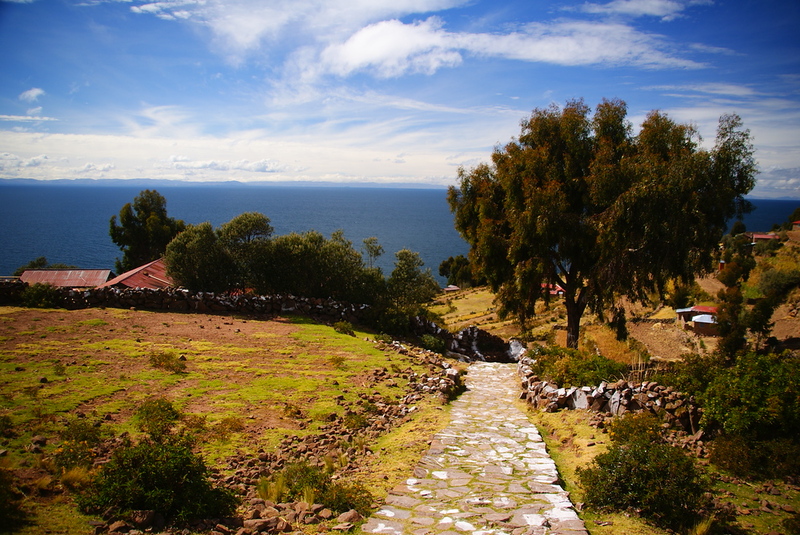 A scenic path leading down to small houses overlooking Lake Titicaca. 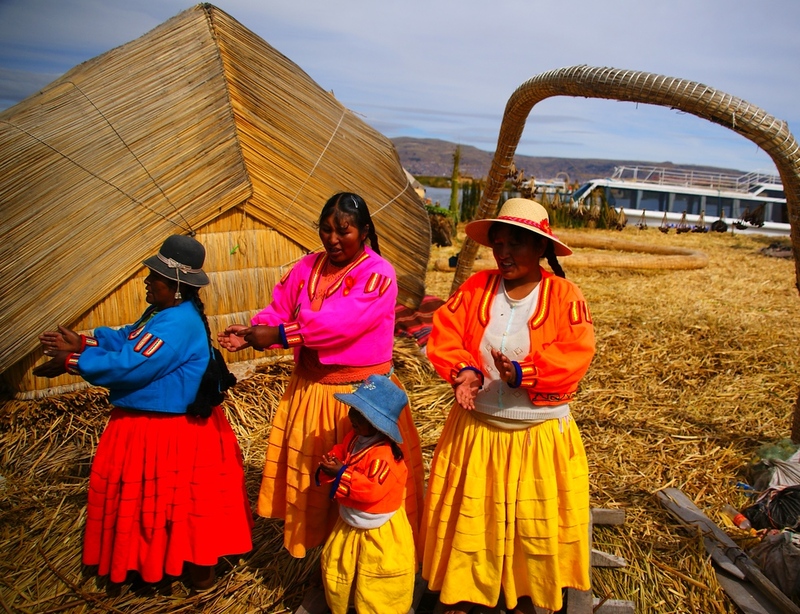 A group of gregarious Uros ladies decked out in traditional attire perform songs and dance for a group of foreign tourists. 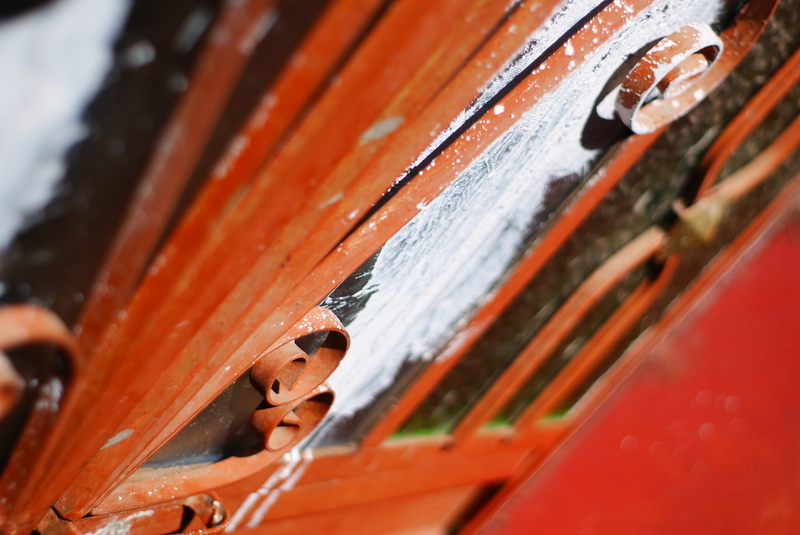 A close-up shot of a aged door with a lot of character – Lake Titicaca, Peru. 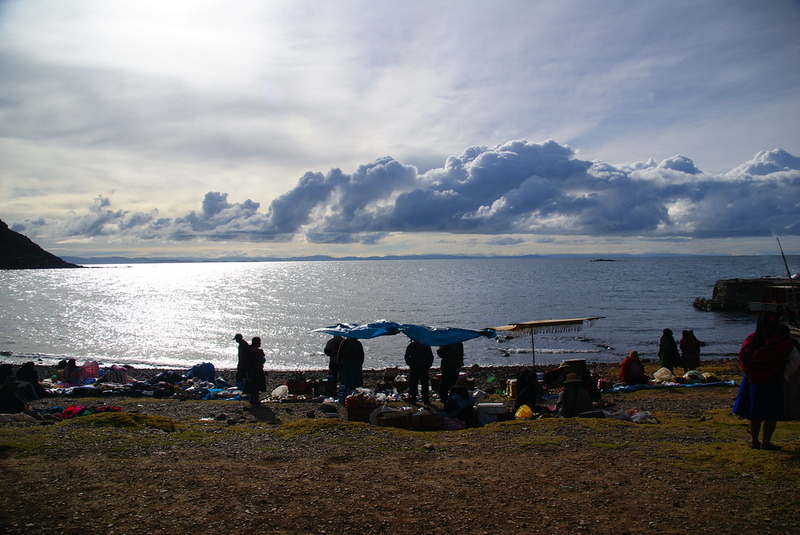 A wide angle shot of locals setting up their stalls overlooking pristine Lake Titicaca. 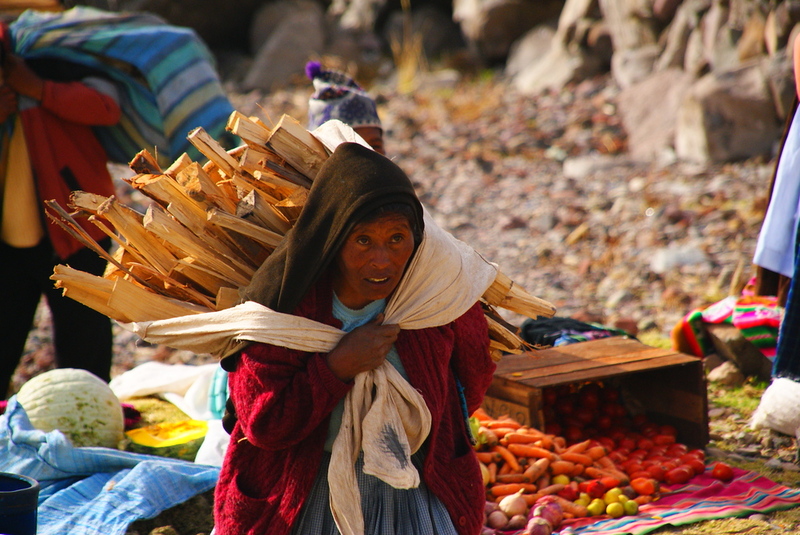 A hunchbacked elderly lady carries a heavy load of what appears to be kindling on her back. 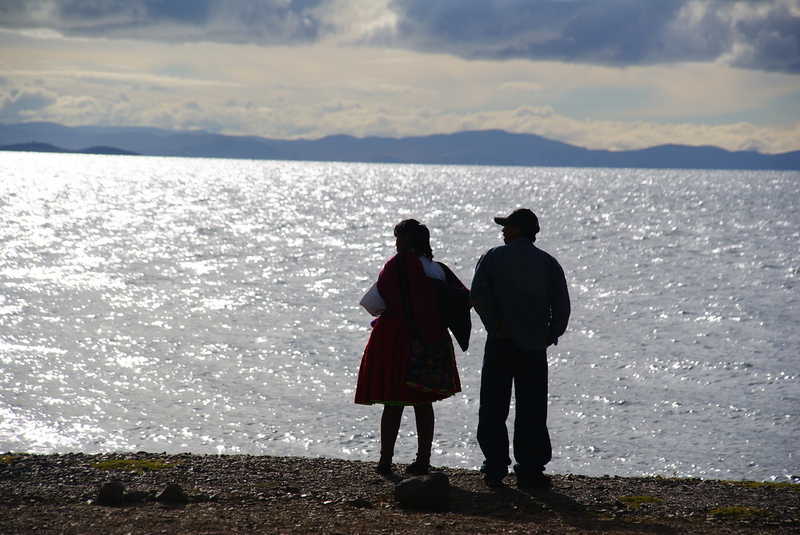 A couple look out over Lake Titicaca in the late afternoon – Peru. A waste basket made out of wood frames this shot of the island. 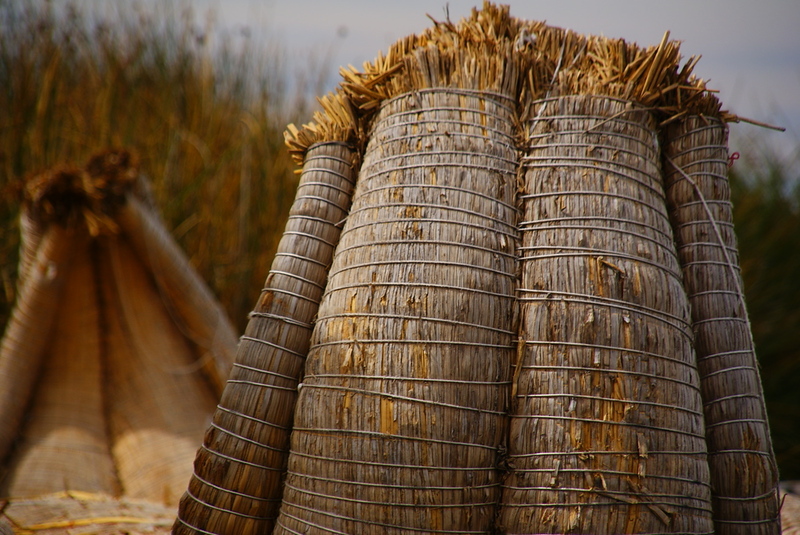 Another shot of the totora reed boats used by the Uros people – Lake Titicaca, Peru. What stunning photos! I was confused about my visit to the floating islands, finding it too much of a tourist gimmick, but looking back on the visit through these photos certainly captures the beauty and mystery of their lifestyle. Thanks Ellen, it’s a fascinating place to visit. What vibrant colours. You’ve really captured the soul of the inhabitants, fab shots Samuel. 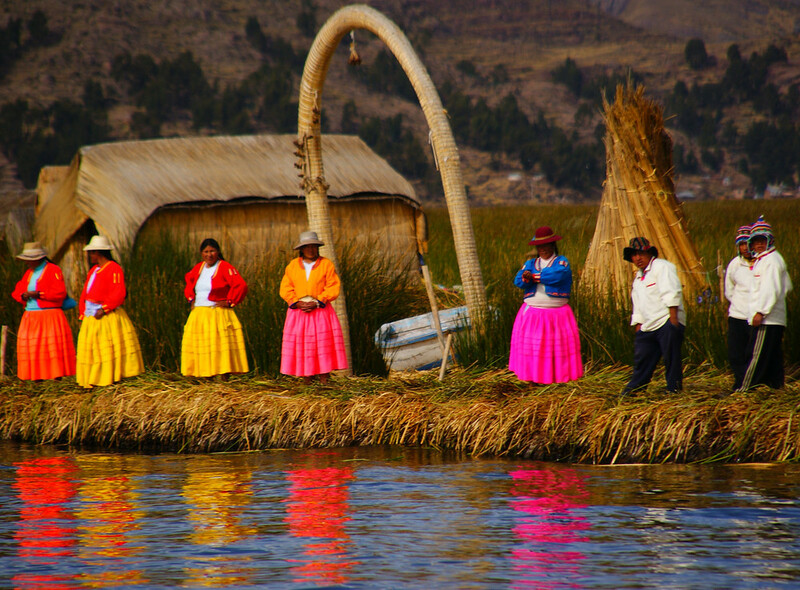 We’re looking forward to exploring South America and I think you’ve just ensured we take a trip to visit Lake Titicaca! Thanks! These are sooo beautiful. Brings back such good memories of our time on Lake Titicaca. I love the juxtaposition of the colorful outfits with the tan colored reeds. I enjoyed reading your article on Peru and viewing these nice images. Absolutely stunning photography. Makes me want to hop a plane and experience it for myself. Thanks so much for sharing. Thanks Maria! 🙂 I’d looooove to go back again soon! What a beautiful photo essay! These photos are dynamic and say a lot about the culture. Definitely on my bucket list now! Beautiful!! So much color and character! I suddenly remembered the “Mercedes Benz”, did they mention that to you too? I reckon they do to all tourists. Had fun chatting with the Uros people. One woman stroke my hair the whole time we were talking. She prolly digs long, shiny Asian black hair. Haha. I didn’t know about the people or the islands they made. Thanks so much for sharing! It definitely was a bit of a show Jarmo 😛 Did you visit any other islands? I clicked through to your post after seeing the first photograph – what fantastic colours! Amazing photographs Sam, well done! I’ve never seen people wear such bright colours before. It was an amazing experience. Ahhhh! These photos are soooo luscious!!! Beautiful photos Samuel! Maybe they are putting up a show for tourists but still it’s beautiful to see so many colors. 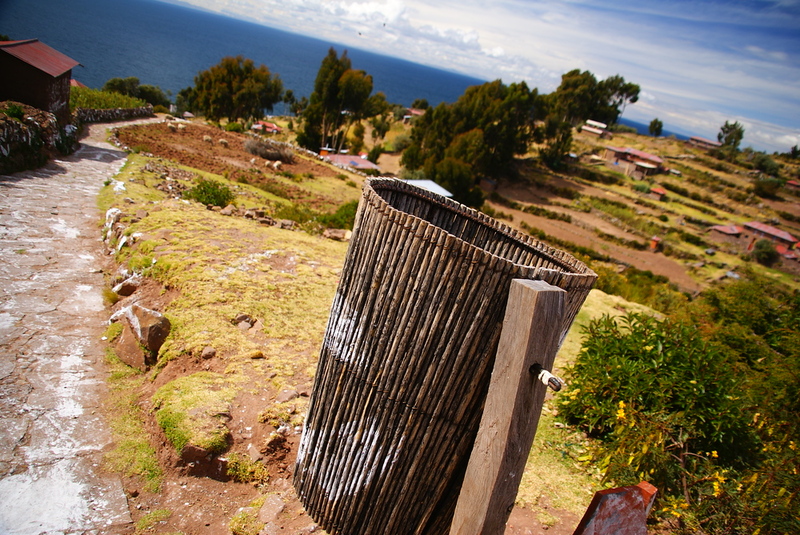 I love the scenery overlooking Lake Titicaca. I can feel the fresh air just by looking at that photo. Wow, some seriously awesome photos in this collection! I love all the vibrant colors. 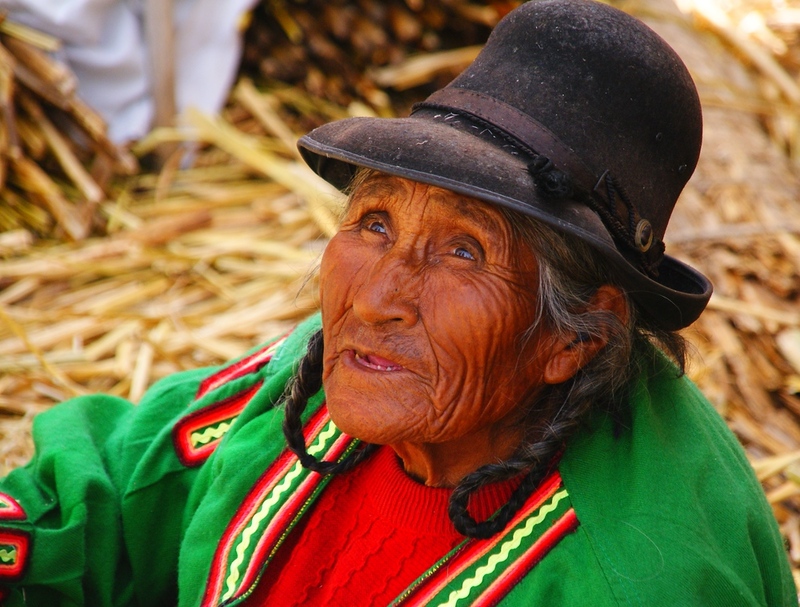 Gorgeous photos Samuel – the colours are absolutely stunning, Peru is definitely on the list now! I love those brilliant colors of their skirts. The placed seemed really good to visit. People looks friendly! Wondefully colourful captures Samuel, really great stuff! Thanks Laurence! I’d like to see the photos you’d capture from here. Fantastic pictures, you caught spirit and colors beautifully. Thanks Angela! Quite possibly the most colourful people I’ve ever met. Looking forward to visiting this place in a couple of weeks – beautiful pictures! I did a very similar tour as you. I think they do put up a show for the tourist but I still found the way they live quite fascinating. From the Bolivian side I recommend checking out Islas del sol for great walking tours of the island.